Snowdonia National Park is the area of Wales within the Snowdonia National Park boundary including the non-National Park 'island' around Blaenau Ffestiniog. Created in 1951, Snowdonia National Park is the 3rd largest in the UK with an area of 2,130 km² (823 sq mi). It covers parts of Conwy, Gwynedd and Powys. Approximately 350,000 people climb and bag Snowdon, the highest mountain in Wales, every year. 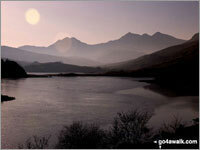 The name Snowdon comes from the Saxon Snow Dun (Snow Hill). The Welsh name for the mountain is Yr Wyddfa (loosely pronounced 'ur-oo-ith-va') which means 'The Burial Place'. Northern Snowdonia is the only place in the UK that you can find the Snowdon Lily (Gagea Serontina) - an Artic-alpine plant. It flowers from June onwards and has white flowers with purple or reddish veins. In 2004 the Independent Newspaper reported that Crib Goch near Snowdon is the wettest place in the United Kingdom with an average rainfall of 4,473 millimetres per year over the previous 30 years. That is 176.1 inches or over 14.5 feet! Better take a waterproof. Snowdonia in Welsh is Eryri (loosely pronounced 'error_ree') which means 'The Highland'. The main places to go walking from in Snowdonia include: Aberdyfi, Abergwyngregyn, Bala, Beddgelert, Betws-y-coed, Blaenau Ffestiniog, Capel Curig, Croesor, Dolgellau, Llanberis, Llyn Ogwen, Nantmoor, Pen y Pass and Rhyd Ddu. There are 237 classified Mountains, Fells, Peak, Tops and Hills that lie within the boundary of Snowdonia National Park National Park. All are within the capabilities of an averagely fit walker, hiker or rambler. To make your peak bagging records easier to manage, we have divided Snowdonia National Park into ten distinct areas which are listed below. If you want to see all 237 classified Mountains, Fells, Peak, Tops and Hills in one go see The Whole of Snowdonia National Park but please bear in mind that the page may take a few extra seconds to load due to the amount of data being downloaded to your computer. Aran Fawddwy, Aran Benllyn, Glasgwm . . .
Arenig Fawr, Arenig Fach, Carnedd y Filiast (Arenigs) . . .
Cadair Berwyn, Moel Sych, Cadair Bronwen . . .
Cadair Idris (Penygadair), Mynydd Moel, Maesglase (Maen Du) . . .
Carnedd Llewelyn, Carnedd Dafydd, Pen Llithrig y Wrach . . .
Glyder Fawr, Glyder Fach, Tryfan . . .
Moel Hebog, Craig Cwm Silyn, Mynydd Mawr (Llyn Cwellyn) . . .
Carnedd Moel Siabod, Moelwyn Mawr, Moelwyn Bach . . .
Y Llethr, Rhinog Fawr, Moel Ysgyfarnogod . . .
Mount Snowdon (Yr Wyddfa), Crib Goch, Moel Eilio (Llanberis) . . .
Snowdon (Yr Wyddfa), Tryfan, Cadair Idris . . .